GetResponse has analysed over 450 million emails that were sent across six countries in Southeast Asia namely Malaysia, Singapore, Thailand, Vietnam, Indonesia and the Philippines from the period of January to June 2017. GetResponse, an email marketing platform, has released their "Southeast Asia Industry Benchmarks 2017" analysis which we have reported here earlier. 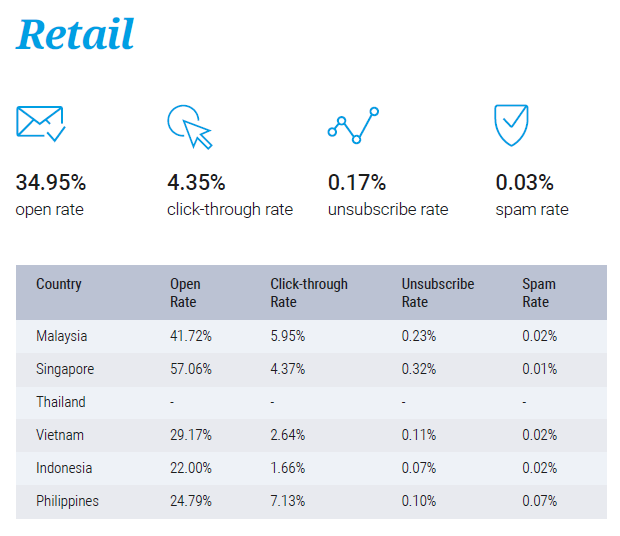 Update (2018 version): What is the average email open rate & click rate in Malaysia, Singapore etc? 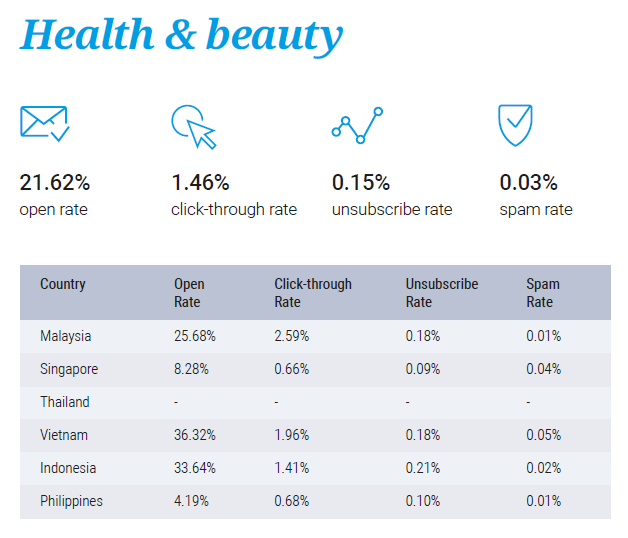 Here, we summarized the report into 15 interesting facts on email marketing performance in Southeast Asia, with highlights on Malaysia. #1. Average Open Rate in Southeast Asia is 26% with 4.9% Click-through Rate. #2. Amazingly, Vietnam has the highest average Open Rate of 45.98% in Southeast Asia. #3. Thailand on another hand has the highest Click-through Rate of 10.41% in Southeast Asia. #4. 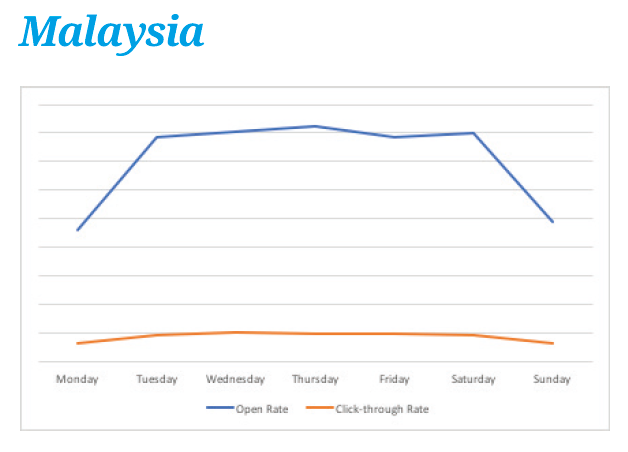 Average email marketing Open Rate in Malaysia is 16.52% with 2.39% Click-through Rate, the lowest in the region. #5. 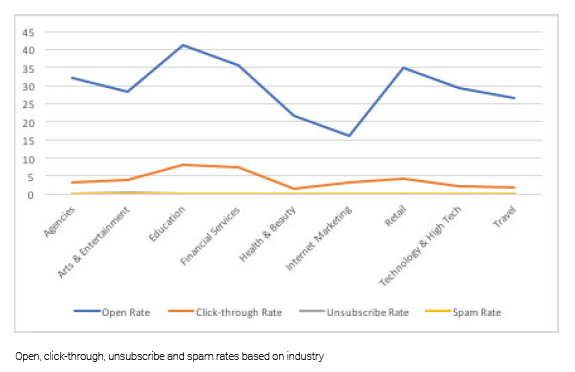 Companies with less than 2,500 subscribers enjoy high average Open Rate of 41.95% and 6.47% Click-through Rate. #6. Among the industries, Education enjoys the highest average Open Rate at 41.06% and Click-through Rate of 8.06%. #7. Health & Beauty companies in Malaysia enjoy reasonably good average Open Rate at 25.68%, higher than the national average of 16.52%. #8. Average Open Rate for Retail companies is relatively high especially for Singapore (57.06%) and Malaysia (41.72%) with good Click-though Rate too. 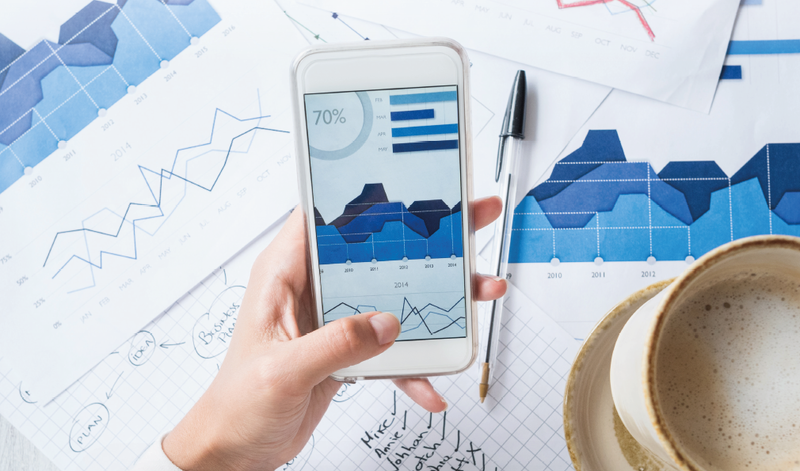 For more analysis by industries like Agencies, Arts & Entertainment, Education, Financial Services, Internet Marketing, Technology & High Tech, Travel, download the GetResponse report here. #9. Malaysians are more likely to open their emails from 3pm to 5pm, or generally during working hours. #10. The average Open Rate for Malaysia spikes again at 8pm after the dip during dinner hours. #11. Open Rate for Malaysia is consistently higher from Tuesday to Saturday, with Wednesdays and Thursdays slightly higher than average. #12. Surprisingly, we are seeing lower Open Rate on Mondays (blues) together with Sundays if compared to the rest of the week. For more analysis by countries like Singapore, Thailand, Vietnam, Indonesia, Philippines, download the GetResponse report here. #13. GetResponse has reported that the use of emoji in email subject does increase overall Open Rate by referring to its global data. #14. 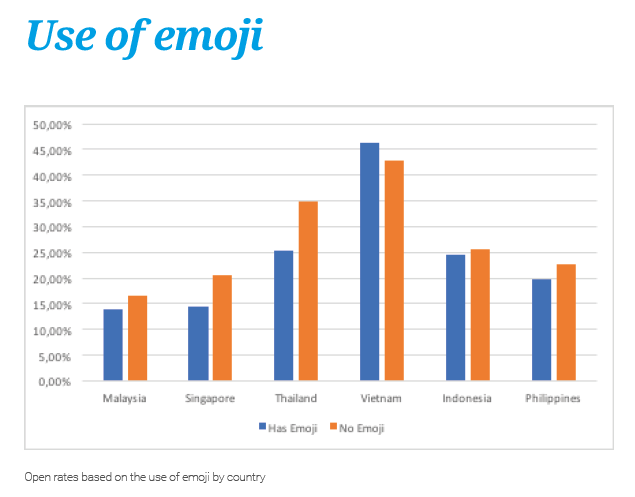 However, the use of emoji does not produce a significant increase of Open Rate in Southeast Asia, perhaps with the exception of Vietnam. #15. 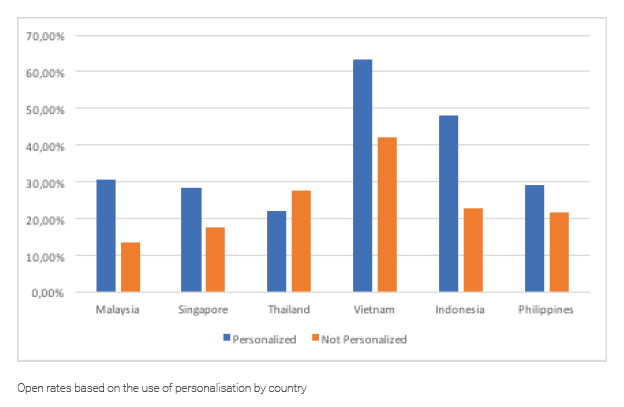 Average Open Rate for emails with personalization is significantly higher (vs those without personalization) for countries like Malaysia, Indonesia and Vietnam. ##lightbulb-o## What is Email Personalization? Personalization refers to the use of custom information unique to the subscriber, be it name, gender, purchase history etc. For the full analysis, feel free to download the GetResponse report. 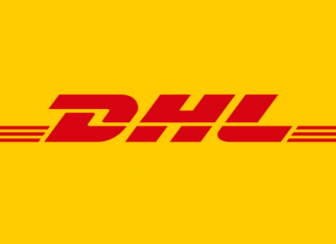 You can also read our article earlier why we migrated from MailChimp to GetResponse. If you have more than 100,000 subscribers, please contact us as enterprise plan might suits you better costing and features wise. On top of that, we will be able to help you manage and design professional-looking email campaign. Otherwise, you can sign-up for a free trial here.